A delegation of more than 15 members and leaders of the Global Ecovillage Network (GEN) participated in the COP21 Climate Summit Conference in Paris in December. Read more about it here. Why did we go? Of course, GEN is engaged in climate mitigation, climate adaptation and climate negotiations, yet we are even more dedicated to preventing outcomes of wrong action by showcasing the ease of transitioning to luxuriously simple lifestyles now. Thousands of ecovillage communities around the world are taking action ranging from green building, implementation of climate friendly agriculture and renewable energy, building water retention landscapes, to sequestering carbon through reforestation, BioChar and soil restoration and responding to crises and disaster with resilient rebuilding practices. Many ecovillages are already net sequestering carbon! We need the political will to scale up the changes needed. In GEN, we hear about floods, droughts, desertification, hurricanes, fires and earth quakes first hand every day, not by listening to the news, but by hearing directly from ecovillages around the world, communities in Bangladesh, Nepal, the Philippines, India, Senegal, Namibia, Sudan, Mexiko, and elsewhere. These are our friends that are being existentially threatened. These are our children that are lacking safety and are going hungry. Climate change, in GEN, is not an abstract issue, but an experience – an issue of the heart which needs to grow in order not to break, and needs to take responsibility not to become numbed by the sheer extent of devastation. Many NGO’s have expended huge efforts to influence policy through the UN system, and specifically at the COP’s, with very limited results so far. In past years, and after Rio+20, GEN has opted to focus mainly on work on the ground, and keep our presence at the UN to a minimum. In 2015, with the adoption of the sustainable development goals in September, and in preparation for COP21, our engagement grew. Christiana Figueres, executive secretary of the UN Framework Convention on Climate Change, initiated a series of pre-Paris meetings in the Findhorn Foundation (where the GEN International office is hosted). Meeting her in person left a deep impression on us. Like many, I stand in awe before this woman! 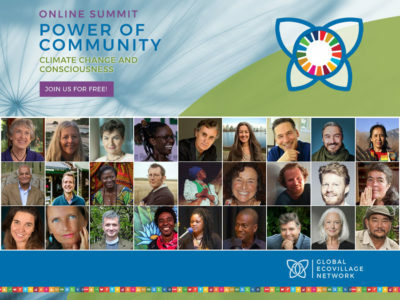 Imagine how difficult it is to create a signed agreement with 195 members of an ecovillage? Now multiply this by the complexity of facilitating a process between the negotiating delegations of 195 nations from around the world and you get an idea of what she has accomplished. And speaking to the negotiating parties: “Find the moral courage to break through this impasse. What is right is to save the future of our planet”. He deserved the standing ovation he got. I was touched by his capacity to influence – the timing was right, the place was right, and I feel certain that he swayed some of those present. In the end, an agreement was signed that aims to hold the increase in global average temperature well below 2 degree C above pre-industrial levels and to pursue efforts to limit them to 1.5 degrees. This is definitely ambitious, and better than most dared to hope for. Genuine concern, public opinion and international pressure helped to produce these results. However, the individual pledges of countries brought to the table, the so-called ‘Intended Nationally Determined Contributions or INDC’s, are more in line with a 3 degrees rise. In other words, no one knows how to the target of 1.5 degrees will be implemented! Good intentions are worth a lot, but don’t yet create an outcome. Many of the communities in GEN have done heroic work to actively influence local climates through regenerative strategies. These efforts can only unfold their full potential when they are spread to become systemic. There is no way for governments to implement societal change without the active participation of their citizens. And good governance can create favourable frameworks that allow the best bottom-up solutions to thrive and spread. If good governance and strong participation come together, we can do anything! While the Copenhagen COP15 failure left us all with a bitter aftertaste, COP21 has given us a sense of hope that change might, after all, be possible. In the end, French President Francois Hollande told the assembled delegates: “You’ve done it, reached an ambitious agreement, a binding agreement, a universal agreement. Never will I be able to express more gratitude to a conference. You can be proud to stand before your children and grandchildren.” I came back from Paris inspired and dedicated to help scale up GEN’s outreach into the world – to bring our piece to the puzzle in actually implementing the change needed. We need strong global binding agreements and good governance – and we need the power of communities to care for their environments, the power of solidarity amongst the people on the ground to be unleashed. GEN has its part to play through inspiring ecovillage incubation, scaling up ecovillage transition strategies, working through green school approaches, bringing our solutions to disaster relief work and influencing policy. Thank you to the GEN team at COP21!